Flemish painter. The year he was born his parents left Antwerp for Dordrecht, where Artus became a master in 1603. He returned to Antwerp c. 1615, initially as an assistant of Otto van Veen in whose house he was living. 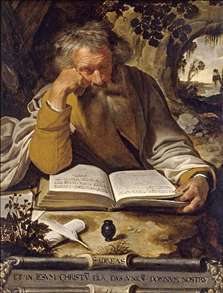 He executed a number of commissioned altarpieces, such as the Ascension and the Assumption of the Virgin (both c. 1617; Antwerp, St Paul). Most of his oeuvre, however, consists of compositions, usually with life-size figures, intended for the open market or private individuals. These are mainly scenes from the Life of Christ and other religious subjects, as well as mythological themes. Among his most characteristic works also are his serial representations of the Twelve Apostles, the Four Evangelists and Four Fathers of the Church, shown half life-size. That there are various versions, of differing quality, of most of these scenes suggests that Wolffort must have had a workshop. Among his assistants were such painters as Pieter van Lint and Pieter van Mol, whose work was clearly influenced by Wolffort and who made replicas of his compositions. Wolffort s work was virtually unknown until the late 1970s; some paintings were even thought to be early works by Rubens. The starting-point for the reconstruction of Wolffort s oeuvre is the fully signed Women Bathing (untraced; replica, London, Victoria and Albert Museum), together with several pictures bearing a monogram. His early work, to c. 1630, is stylistically close to that of van Veen. Not only is it painted in the same classicizing manner, it also uses identical motifs and compositions. The same proto-Baroque style characterizes such pieces as the Feast in the House of Simon (best version, Bergues, Muse des Beaux-Arts). A more dramatically Baroque form in the Rubensian sense did not emerge in Wolffort s oeuvre until later, as in the Adoration of the Magi (Berlin, Schloss Charlottenburg).